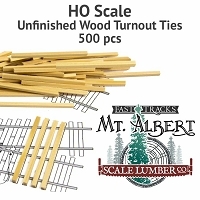 These HO scale, 10"x10" strips are sold in 24" (610 mm) long pieces. NOTE: This product was sold under the part number B138B24 in the Mt. Albert Scale Lumber catalog. The Fast Tracks part number for this product is now STB-HO-10x10-24. Mt. Albert lumber is a very high grade, well-dried wood. It's very stable, straight and consistent in quality. I will be buying a lot more of it for all of my scratch-building products.